Bethesda native Nils Lofgren got his start in music in the D.C. area. He went on to play with Neil Young and Ringo Starr and has been a member of Bruce Springsteen's E Street Band for more than three decades. Lofgren is playing solo shows at The Birchmere Friday, Saturday and Sunday. Fifty years ago this month, a high school dropout from Bethesda headed to New York City with a few of his friends in hopes of becoming a rock star. 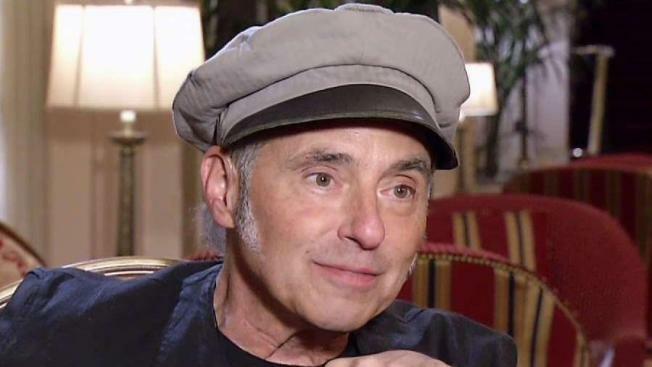 Looking back, Nils Lofgren has no regrets. Lofgren and his band, Grin, would find work. In fact, Lofgren hasn’t stopped working since. He’s recorded and toured with musical greats like Neil Young and Ringo Starr. Lofgren has most notably been serving as backup guitarist to Bruce Springsteen and the E Street Band, a gig he’s had for 34 years. But Lofgren said he was a fan long before he was a member of the Rock & Roll Hall of Fame band. Lofgren first learned to play the accordion, then his brother Tommy started showing him some guitar licks. “He was my first guitar teacher,” Lofgren said of his brother, who will join him on stage this weekend at The Birchmere. In fact all three of Lofgren’s brothers will join him on stage. Lofgren was 16 years old Aug. 13, 1967, when he saw Jimi Hendrix perform at the old Ambassador Theater in Adams Morgan. Lofgren was in the front row for what went down in D.C. history as one of the greatest rock shows of all time — the night Hendrix set his guitar on fire while members of The Who sat in the front row. “One night I saw, at Constitution Hall, The Who, the original Who, with Herman’s Hermits and the Blues Magoos, who had the first five blinking suits in rock history,” Lofgren recalled. “We all rushed over to see Jimi Hendrix’s late show at the Ambassador Theater. "I still remember that night. Jimi broke up his guitar, I guess in honor of Pete Townsend, who’d come over and was in the audience, and he took the guitar neck and he threw it in the audience, and I had made my way to the front row, and the neck landed right at my feet. All these people were swarming over me and through me to get to the guitar neck. And I still remember I didn’t care about the guitar neck. I didn’t want to take my eyes off of him. That would not be the last time Hendrix and Lofgren would cross paths. Lofgren saw Hendrix perform more than a dozen times, but three years after seeing Hendrix at The Ambassador, Lofgren and his band, Grin, got a gig in California. “We opened for anybody and everybody,” Lofgren said. “Frank Barcelona, one of the great booking agents of all time, Art Linson who was my manager at the time and still like a brother to me, I’ll never forget he called and said, ‘Hey, I got you another opening act slot.’ I said, ‘Yeah, for who?’ He said, ‘Jimi Hendrix, and one of the nights is on your 19th birthday.’ So June 21 and a couple of other nights in California, Grin opened for Ballin’ Jack and the Jimi Hendrix Experience. While Lofgren credits Hendrix with inspiring him to follow the dream of being a professional musician, he said it was watching two D.C.-based guitarists that also lit the fire. Lofgren also credits another D.C. guitar slinger, who, like Buchannan, sadly took his own life. Lofgren loves returning home to the D.C. area, and not just to see his mom and three brothers, who all still live in the area. Lofgren said he embraces the familiarity of his hometown and the memories. “Naturally brings up a lot of memories of growing up at my mom and dad’s house, going from accordion to guitar, going from amateur, fun guitar player to thinking I could be a professional,” he said. Lofgren has remained busy since the E Street Band has been on a break while Springsteen performs his one-man show on Broadway. Lofgren is also very excited about the box set he recently released showcasing his 50 years of music. As he’s grown older, Lofgren has had to change some things about his lifestyle and his live shows. He no longer spends 15 to 20 hours a week playing basketball — “I loved playing three-on-three,” he said. “I’d play every day.” — and he’s no longer doing back flips or jumping off amps while playing guitar. Double hip replacement 10 years ago ended all of that. So Lofgren took up tap dancing, and yes, he’ll be dancing during his solo shows. Locally, Lofgren is known not only as one of the greatest guitarists to come out of a town known for great guitarists, he’s also known for two songs he wrote that he rarely, if ever, performs: his ode to the 1978 NBA champion Washington Bullets, “Bullets Fever,” and a 26-second commercial jingle for Jhoon Rhee taekwondo studios. Lofgren said someone mentions the Jhoon Rhee song, “Nobody Bothers Me,” on a regular basis. Lofgren remembers that one day Smith asked him for a favor. The commercial would run on TV for more than a decade. As Lofgren prepares for his fall solo tour, he’s unsure when he’ll be back on stage with Springsteen and his E Street bandmates. While the guitar virtuoso has no plans at the moment for reuniting with Springsteen, he has big plans for his solo career. After his new album is released, he’d like to put a band together and hit the road again. Lofgren appears with his brothers at The Birchmere this Friday, Saturday and Sunday.